Gilimbaa: An Indigenous Creative Agency. Australia's first Indigenous doctor has been named 2011 Queensland Australian of the Year. Professor Noel Hayman is a graduate of The University of Queensland's School of Medicine and Director of a health centre in Inala, Brisbane. Mr Hayman will now join other state recipients as finalists for the Australian of the Year awards in January 2011. To read more on this good news story, click here. QLD Australian of the Year 2011 - Professor Noel Hayman. Sydney is currently hosting the inaugural Corroboree. The 11 day festival is a celebration of Aboriginal and Torres Strait Islander cultural in a.. The National Architecture Awards are an annual event run by the Australian Institute of Architects. Last night they were held at the Sydney Opera.. The Indigenous Marathon Project (IMP) sent a group of athletes to the New York City Marathon to run the race of a lifetime. The 2013 IMP squad..
After a successful inaugural Boomerang Festival, the organisers behind the event have announced they will be bringing the festival back next year..
South Arrernte woman and acclaimed artist Jenni Kemarre Martiniello was named the overall winner of the $40 000 Telstra National Aboriginal and T.. It was the 19th annual Deadlys that saw a bunch of very talented Aboriginal and Torres Strait Islanders recognised for their hard and consistent .. While the nation has been caught up following the federal election campaign for the last month, AIME has embarked on a campaign of their own, The..
Phoenix is the new album from fresh talent Jimblah, and it's set to be released this month on Elefant Traks. Jimblah is a member of the ..
Mbantua Festival is a new initiative showcasing song, dance, artwork and culture from desert communities. It's taking place from October 9 to ..
Bruce Pascoe has taken out the Prime Minister's Literary Award for Young Adult Fiction for his book Fog a Dox. The Australian writer is also a.. The inaugural Boomerang Festival is happening from October 4th to 6th this year, and will celebrate Indigenous culture from Australia and around .. The Larrakia traditional owners, alongside the CSIRO, have created an incredible interactive resource that depicts the seven seasons of the Gulum.. The South Australian Museum are making a massive investment in digitising their collection of Indigenous artefacts and historical photos. The .. The annual Darwin Aboriginal Art Fair happened last weekend, 9th to 11th of August, and was yet again, a great success. The event, which has b..
Move It Mob Style has been popular from the word go and the exciting news is, there's no stopping the Move it Mob Style crew, with the first epis.. This Friday is the International Day of the World's Indigenous Peoples. This year's theme centres around "Indigenous peoples building alliances: .. Yesterday marked National Aboriginal and Islander Children's Day, which celebrates Indigenous children and recognises the importance of the..
From the best in AFL and NRL to award winning films and documentaries, the Deadly Awards are a showcase of Australia's Indigenous peoples' highes.. The nation's primary Indigenous current affairs program, Living Black, celebrates a decade of production this year. Started in 2003 by its cur..
A recent report for the Council of Australian Governments (COAG), on behalf of the COAG Reform Council, has shown more needs to be done in closin..
Gurrumul Yunupingu and Delta Goodrem sang a duet of Bayini on the popular talent show, The Voice, last Monday to mark National Reconciliation Wee..
David Gulpilil was awarded the Australia Council's top arts award, the Red Ochre award, at the Sydney Opera House earlier this week. The film ..
Gilimbaa and our sister design agencies Josephmark and Breeder, who are also residents of Substation No. 4, have created a window installation in..
Warakuna: all the stories got into our minds and eyes, is an exhibition focusing on the art movement developing in the Western Desert community o..
Yiwarra Kuju: The Canning Stock Route is an exhibition telling the story of the world's longest historical stock route and its affects on the cou..
Colour Theory is a new and exciting program on NITV, hosted by Richard Bell, featuring Indigenous art from around the nation. ..
Brisbane's Jesse Williams has been picked by the Seattle Seahawks in the fifth round of the US National Football League (NFL) draft. .. The Federal Government has announced $777 ..
Sydney will play host to the largest national Indigenous arts and cultural festival for 11 days and nights in November. Running from November ..
Crown Resorts launched their Reconciliation Action Plan (RAP) in Melbourne just over a week ago. The RAP is represented by the artwork Crown comm..
Aboriginal artist, Bronwyn Bancroft, has just completed a major public art commission for Sydney's Royal North Shore Hospital. Bancroft states.. The Dja Dja Wurrung people have been formally recognised as the traditional owners of about 267 000 hectares of land in central Victoria. Afte.. The South Australian Parliament has passed a Bill officially acknowledging Aboriginal and Torres Strait Islander peoples. The amendments to the S.. It remains a fact that Aboriginal and Torres Strait Islander People still die 10 to17 years younger than other Australians. National Close the Ga.. The artists of Papunya Tula, who revolutionised Australian art with their paintings on board and canvas, are exhibiting at the Art Gallery of NSW..
Last week, Federal Court Justice Neil McKerracher handed down the decision validating the Yindjibarndi Aboriginal Corporation (YAC)'.. The Uluru-Kata Tjuta National Park took out best Major Tourist Attraction at the 28th Australian Tourism Awards earlier this week. The award w..
Reconciliation Action Plans (RAPs) have had a profound effect on creating awareness and understanding among Indigenous and non-Indigenous Austral..
Indigenous soul rocker Dan Sultan has been signed to the Liberation label, a sub-label of Mushroom Group which is one of Australia's largest inde..
Shane Phillips, local Redfern man and advocate for Aboriginal rights, was awarded Australian Local Hero at the Australian of the Year Awards last.. There aren't many tennis players who can say they've reached a grand slam final at just 16 years old. But Ashleigh Barty can. The rising Indig.. The Medics took out Best New Talent at the 4th Annual Rolling Stone Awards in Sydney last Wednesday. The four-.. The second annual Indigenous Business, Enterprise & Corporations (IBEC) Conference, hosted by UWA Business School's Centre for Social Impact .. The people of far north Queensland's Tableland Yidinji have had their native title rights recognised by the Federal Court of Australia. A cons.. The groundbreaking Australian band, Yothu Yindi, will be inducted into the ARIA Hall of Fame at the 26th annual ARIA Awards, this Thursday. Af..
Beautiful One Day is a theatrical documentary about the turbulent life and times of Palm Island. A collaboration of three theater companies; B..
More than 120 of the world's Indigenous leaders met at Yarrabah in far north Queensland for the Global Elders Gathering 2012. The meeting was set..
Geoffrey Gurrumul Yunupingu has been recognised by the University of Sydney for his outstanding creative contribution to the wider community as a.. The director of the hit film, The Sapphires has won the Creative Force of the Year Award, presented by GQ Magazine. .. The Quandamooka People of North Stradbroke Island, in partnership with Indigenous Business Australia, have undertaken the management of Straddie ..
Dan Sultan will headline Rock for Recognition, a touring concert to promote Indigenous rights, starting e..
Tonight is the world premiere of Redfern Now - a new drama series depicting the lives of Indigenous Australians in t.. The Royal Australian College of General Practitioners (RACGP) have made a new ceremonial gown for all RACGP members and an accompanying sash for ..
Documentary-maker Jeremy Geia became the first Australian and English-speaking journalist to obtain an interview with Julian Assange at the Ecuad.. Working alongside UMI Arts, Wayne McGiness opened 'Steel Jidu' in mid-October - his first solo exhibition. He draws inspiration from tradition..
Of Australia's 100 Women of Influence, announced by The Australian Financial Review and Westpac last week, nine are Aboriginal and Torre..
Central Australia's NPY Women's Council and the Yiriman Project from Fitzroy Crossing were the major winners at this year's Indigenous Governance.. The usually-closed Mutitjulu, the Aboriginal community at the eastern edge of Uluru, opened its gates on Saturday to host a rock concert, Other S.. The inaugural Australian Indigenous Fashion Week (AIFW) is set to happen next year, filling a large gap in the fashion industry. The event, ha..
Ella Havelka makes history as the first Aboriginal dancer to join the Australian Ballet. A descendant of the Wiradjuri people, Ella has been danc.. The Deadlys recognise the contribution of Aboriginal and Torres Strait Islanders to their community and to Australian society. The annual event.. The Festival of Pacific Arts (FOPA) is the unique opportunity for the Pacific community to come together to share, revitalise and maintain .. The lineup for the National Indigenous Music Awards has been unveiled this week in Darwin. Dubbed the 'ARIA's of Aboriginal and Torres Strait ..
An impressive exhibition that will be shown at the Venice Biennale 2012, Kevin O'Brien talks about this concept as an idea that which cannot be s.. HUNDREDS of registered public and private events have been held throughout the country as part of National Reconciliation Week (NRW) 2012, with m..
After a nation-wide search, more than 130 applications and an exhaustive screening process, Rob de Castella and his Indigenous Marathon Project t..
ABOUT 500 people gathered in the Sydney suburb of Redfern this afternoon for the annual Black Diggers march. The crowd comprised of war vet..
Set among the tropical waters of Far North Queensland, The Straits is the latest crime drama to hit our television screens. Screening on ABC on T..
Michael Cook, a photographer and Bidjara man from south-west Queensland, has been named in artsHub's top ..
42 kilometres is a long distance to run. For 11 young indigenous Australians it was the final stretch in a journey that saw t..
GEOFFREY Gurrumul Yunupingu has scored six ARIA nominations for his second album, Rrakala. .. The 17th Deadly Awards were held at the Sydney Opera House on the 27 September, recognising outstanding Aboriginal and Torres Strait Islander ach..
Geoffrey Gurrumul Yunupingu has scooped the pool at the inaugural National Indigenous Music Awards in Darwin. ..
A PAINTING that reflects more than 90 years of family history has won South Australian artist Dickie Minyintiri the prestigious Telstra National ..
Indigenous All Stars hero Preston Campbell's signed, handpainted football boots will be auctioned as part of this week's NRL Close the Gap Round ..
Telstra has recently launched their new RAP for 2011. ..
Caloundra Regional Gallery was abuzz last night w..
03.06.11 | A World of RAP Dreams! Dreamworld and Whitewater World - two of Australia's most visited theme parks, have launched a new world of respect, culture, heritage and a cont..
Former Essendon star player Michael Long has again lead thousands in the support for Indigenous wellbeing with the 2011 Long Walk to the MCG in M..
18.05.11 | The Maroon's Hi-5! The Queensland XXXX Maroons team for the first game of the 2011 Harvey Norman State of Origin Series will again, feature a strong representation .. The marriage of Indigenous art with a contemporary and modern canvas is always an exciting event. Recently, Queensland Rail's Tilt Train servi.. He is a Rugby League all-rounder - an Indigenous All Star, a Maroon's veteran, an Australian Representative and a very proud Brisbane Bronco. ..
A sporting hero to all Australians, it is with great sadness we pay tribute to the passing of Lionel Edward Rose - (21 June 1948-8 May 2011). .. The Australian Rugby League VB Kangaroos have had an impressive win over the New Zealand Kiwi's with a 20-10 victory, featuring a strong inclusio..
Aboriginal Supermodel Samantha Harris, has been featured on the cover of Jetstar's in-flight magazine. In the March 2011 edition of the Airlin..
Patrick Mills is fast becoming an NBA sensation in the United States with his second year as a point guard for the Portland Blazers. Featuring.. Renowned Musician Geoffrey Gurrumul Yunupingu has reached a new industry height, featuring on the cover of Rolling Stone Magazine. Rolling Sto..
Gilimbaa has joined the NRL in contributing some unique memorabilia from the All Stars game to help raise funds in for the Queensland Premier's D.. He's won pretty much every music award in Australia and last night Dr Jimmy Littl..
An Indigenous University student from South Australia has made history as Australia's first Indigenous Rhodes scholar recipient. Rebecca Richa..
02.12.10 | Gilimbaa's Deadly Treadly! This year from November 17-21st November, the international Bicycle Film Festival (BFF) celebrated its 10th year and Joyride, has selected a numb..
Australia's first Indigenous doctor has been named 2011 Queensland Australian of the Year. Professor Noel Hayman is a graduate of The Universi..
Anangu artists have proudly put their traditional stories of Uluru on semi-trailer road trains for a national roadshow. The trucks feature dre..
Gilimbaa were proud to be supporters of the Murri Magic Indigenous Women's Rugby Union team, by designing and painting the team members boots to ..
Lionel Morgan - the first Indigenous man to play in an International Rugby League test, along with Preston Campbell and Maroon's legend Artie Bee..
Blues, roots and rock sensation Dan Sultan, is now a national revelation after surfacing as a pleasant surprise at this year's Australian Recordi.. The NRL's Gold Coast Titans will be taking Indigenous students under their wings for the club's new mentoring scheme - Titans Beyond Tomorrow. ..
Aboriginal discus thrower Benn Harradine has become only the second Indigenous Australian field athlete to win a Commonwealth Games gold medal. ..
A Cherbourg Elder who is one of the driving forces behind the community's Ration Shed project has won a Premier's Award for Seniors. Sandra Mo..
24.09.10 | Sing Out Sister! Australia's most renowned female Indigenous singers and songwriters will come together with their Indigenous sisters from New Zealand, the Pacifi..
2010 QIECC Annual Forum "Little Feet, Big Steps - from Zero to Hero'' 13 - 14 October 2010, Hotel Grand Chancellor- Surfers Paradise � The .. The 'Before Time Today' Exhibition of Aurukun Art will be on show at the University of Queensland's Art Museum until November 28, 2010. The exhib..
07.09.10 | Gurrumul takes two! Gurrumul Yunupingu has been acknowledged for his astounding talent by receiving the impressive Act of the Year award for the second time at this ..
Gilimbaa's Creative Director Riki Salam, was recently featured in the NIT (National Indigenous Times). Speaking about where he's from, his chi..
Gilimbaa has joined in this year's national NAIDOC week celebrations by showcasing a visual art display on the front..
Australia's international Indigenous arts festival unfolded over 11 - 14 June at the renowned Woodford festival grounds at Woodford (1 hour north..
May 2010 saw the 10th anniversary of the Bridage Walks for Reconilication. It started in Sydney in May where over 300,000 people marched across t..
Gilimbaa's CEO David Williams recently travelled .. The 'AFL Boots and Dreams Exhibition', launched in Melbourne last night, celebrates the achievement and contribution of Indigenous players to the.. The ARTIE program is run by FOGS (Former Origin Greats) to encourage and reward the academic, cultural and sporting achievements of Indigenous ..
On February 13, Skilled Stadium was host to the Gold Coast Indigenous All stars vs the NRL All Stars before a sold out stadium. The Indigenous t..
AIMSC (pronounced am-see) - Australian Indigenous Minority Supplier Council - kicked off the new year by announcing a new round of Indigenous.. 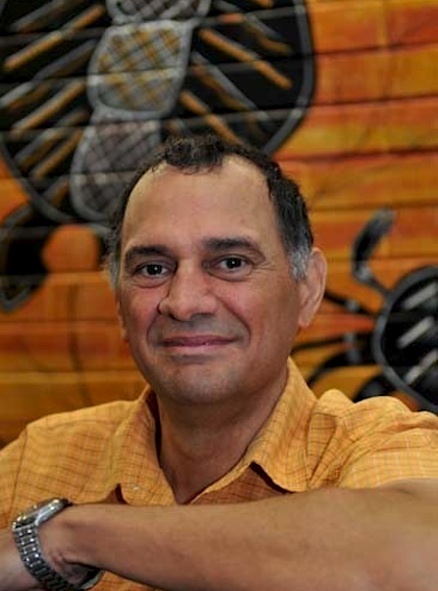 The Australian Catholic University launched its Centre for Indigenous Education and Research late last month at the ACU's Brisbane campus by Vice.. The 15th annual Deadly Awards were held at the Sydney Opera House Concert Hall on Thursday October 15. The Deadlys promote the achieve.. The first National Indigenous Photography Forum will be held from October 12 - 14 in Melbourne. It has been established b..
Short films by Deborah Mailman, Adrian Wills and Leah Purcell will be among those showcased wh..
Brisbane's Riverstage was packed for a sold-out tribute to Indigenous music icon Kev Carmody performing on the 1st A..
'From self respect comes dignity and from dignity comes hope.' This was the message Tom Calma presented during his delivery of the Mabo Oration a.. The 2nd Indigenous Economic Development Conference was held from the 27-29th of May in Melbourne. The event organised by the Koori Business Netwo..
Gilimbaa travelled to Sydney to attend the launch of the Australian Law Reform Commission's Reconciliation Action Plan and the launch of its late..
Aboriginal artist and performer David Williams travelled to London to perform at a memorial service for the victims and survivors of Victoria's b.. In February, Queensland Business Review profiled Gilimbaa. How the business was started, and the exciting projects that we've worked on. Read ..
Letterbox is an Indigenous children's television game show that focuses on education through entertainment. Scheduled to go to air nationally in ..
Congratulations to Australian of the Year, Professor Mick Dodson. In Prime Minister Kevin Rudd's speech at the awards ceremony, he described Dods..
Indigenous Australian history was one of the main storylines woven through Baz Lurhmann's acclaimed film Australia. Crafted using individual stor..
Gilimbaa's Creative Director David Williams was featured in a Koori Matil article, Hagen's view published in early November. .. The John Newfong Media Prize was held at the TransContinental hotel in Brisbane on the 29th of October. The prize is in recognition of the won..
Footsteps Gallery was the venue for the SEQICC Networking @ Night event in October.� Guest speakers Bridget Garay (Director) of Footsteps and Gra..
Gilimbaa's Creative Director David Williams had a whirlwind trip to Los Angeles in late October to perform the didgeridoo as part of Qantas's cel..
Fresh from his trip to China, Glimbaa's creative director David Williams brought many experiences back with him after performing at the Opening C..
On Thursday July 10, the walls of Substation No 4 hosted the photographic works of Hamish Cairns as an introduction to the community of Doomadgee.. The South East Queensland Indigenous Chamber of Commerce held their latest event, Networking @ Night at the Chalk Hotel in Brisbane. "Having a y.. In late May, photojournalist Hamish Cairns travelled up north to the remote community of Doomadgee. He was escorted by a Waanyi Garawa young trib.. Team members of Gilimbaa attended the Reconciliation Conference at the Brisbane Convention and Entertainment Centre. "This was a great opportu.. The Office of the Public Advocate (a branch of the Western Australian Government), were seeking artwork and branding for their department. They w..
Gilimbaa's Creative Director David Williams travelled to the United Arab Emirates at the end of March to participate in a cultural exchange progr..